Click here to see a classic commercial. "........better coffee, milionaires, money can't buy". Heck.....I hated coffee but remember the commercials !! LOL !! Still buy it at New Egypt market. The coffee is still around. That was my mom's brand in FL. A CFUN restaurant recently opened in NYC on 23rd St but it's closed already. ". . . better coffee Rockefeller's money can't buy"? They changed it to "a millionaire's" when the family threatened to sue! Amusingly, these days, Chock Full O' Nuts coffee has this written on the plastic lid: "NO NUTS! 100% Pure Coffee." Apparently, some younger consumers incorrectly assumed that something named "Chock Full O' Nuts" actually contained nuts. Chock Full o' Nuts Cofee House is making a comeback. The recently opened on 23rd St in Manhattan. 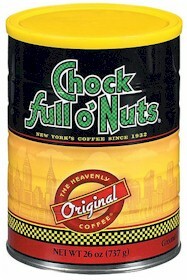 .♪♫♪♫♪....Chock full o' nuts is a heavenly coffee,..better coffee a millionaire's money can't buy ! ...♪♫♪♫. I used to have lunch at the Chock Full o'Nuts shop ont Lexington bet. 43rd and 44th Street in Manhattan almost every day. Their cream cheese sanwiches on Nut Bread were great. After his baseball days, Jackie Robinson became an executive for the company, and since corporate HQ was right above this store, I used to see him coming and going frequently. Are there still Chock Full o'Nuts coffee shops? In the city they were on the ground floor of office buildings. There were also a few stand-alone buildings with that ornamental crooked chimney on the roof. I still love Chock Full o' Nuts. It's the best coffee.